The Belgian Malinois is an extremely active, high-energy breed that is constantly searching for ways to be physically and mentally stimulated. It requires stimulation, both mental and physical, on a daily basis and is a great pet for big families or families with a big house so it has room to run. Fenced in yards are great for this breed, as they love to run, dig, and chase. They are very intelligent and easily trained. It is not a clownish dog, as it can be very serious as times, especially when presented with a task. It tends to be aggressive when approached by another dog or another type of animals. If if it not given space to run, it will run in circles, as it becomes restless. It protects its home and its family and is a wonderful guard dog. Because this dog requires a high amount of energy, it is best suited for an active family. It will require a large amount of exercise, perhaps even twice a day. Exercise suggestions include long walks, long hikes, jogs, and strenuous games in the yard. A leisurely walk in the park will not suit this breeds needs. As its coat tends to be fairly short, it only requires brushing once weekly. However, during periods of shedding it will require more maintenance to its coat. The health concerns of this breed include minor concerns and some that are only just occasionally seen. As for major concerns, there really are not any that tend to be reoccurring in the breed. Minor concerns include Chronic His Dysplasia and elbow Dysplasia. Both should be treated immediately if you sense any type of pain or discomfort in your Belgian Malinois stemming from its elbow joints or its hip joints. It also suffers on occasion from PRA, cataracts, pannus, and hemangiosarcoma. It is suggested that you test your dog regularly for hip, elbow, and eye issues. If you do this, then you will be able to catch anything that may be wrong right away. If you keep your pet healthy, then it should live anywhere from 10 years of age to 12 years of age. 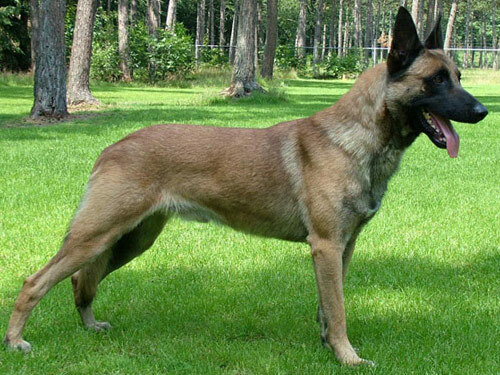 The Belgian Malinois is one of the three breeds that makes up the Belgian Sheepherding breeds. This one is also known as the Chiens de Berger Belge, and it is known most famously for being a guard dog and shepherd dog in Belgium. They were originally bred for their phenomenal shepherding skills, amongst other abilities, rather than for how they will look; unfortunately, no exact record was kept identifying what was bred with what to create this breed. When dog shows became popular in the 1800s, it was difficult to include the Belgian breeds, as they had no recognizable traits that distinguished them from one another. A professor in the late 1800s researched this breed and found similar breeds, such as the Belgian Shepherd. They had much fuller coats than the Malinois. This breed became popular in America during World War II, however, after the war, their popularity plummeted.